All the useful information that you need to know before sending money with Western Union! Launched in the year 1851 in New York, USA, Western Union has been serving the people from the past 168 years. The company has its headquarters in Meridian, Colorado, and was best known for its exchanging telegram service in the US, which was discontinued in 2006. Western Union helps in transfer funds cross-border, cross currencies to small businesses, global corporations, families, NGOs and many more that are remotely located somewhere on Earth. It has placed more than 150,000 ATMs and kiosks across the world, which helps it in completing more than 800 million transactions till 2017. The company offers its money transfer services through digital, mobile, and retail channels, with an array of convenient pay-out options to meet business and consumer needs. There is no maximum transfer limit, while the minimum transfer limit is just USD $1. If you are wondering whether you should use its services or not, it’s best to decide it after reading the whole review of Western Union. The company has been highly secured and authorized by various authorities in different countries, so you can transfer the funds worry-free. On an overall basis, we rate 8.5 out of 10 to the company. Pricing : How much does Western Union cost? The Western Union fee is highly variable which depends on multiple factors. This includes factors such as country you are sending money to, payment mode, pay-out mode, transfer amount and method. This fee majorly lies in between $0 (free) to $150. You will get to know how much amount you have to pay when you start the transaction. It charges less on the bank transfer while more for the debit and credit card transfers. The company offers mid-market exchange rates and also makes the profit in exchanging currencies. Therefore, its margin exchange rate would be a bit lower than the prevailing rates in the market. So, it is important for a customer to pay attention to the rates while transacting with Western Union online. These exchange rates also vary depending on how one pays for the transfer and how the recipient receives the money. It also offers better exchange rates when you send a larger amount, so, experts say that you should try to send money once rather than a bundle of transfers. Western Union is not the cheapest option but its rates being often competitive comparing to bank transfers, therefore, we rate it 8 out of 10. Transparency: Does Western Union have any hidden fees? The company does not have any hidden fees. The recipient will receive the amount that has been shown on the transaction page. So, customers should be sure while using the services of Western Union. One can track the transfer through Money Transfer Control Number (MTCN) provided by the company through email just after the completion of the transaction. The company has been providing the transaction tracking page, where you can directly check the transfers without logging into your account. Western Union has no hidden fees and an excellent tracking procedure; therefore, the experts of Exchange Rate IQ provide it 10 out of 10 for the transparency. Transfer Speed: How long does it take to send money through Western Union? The company offers both fast and late transfers depending on the need of the customer. The fast transfers attract more fees, while the transfers which take time have low fees. Therefore, it has no option for fast and cheap transfers. Transfer from debit or credit card and choosing a cash pickup comes with fast options of “Money in Minutes” or “Next Day”. Western Union online transfer through bank accounts and cash pickup may take up to 4 business days. Transfer from a bank account to a bank account can take up to 7 business days. All this time depends on the destination country, payment mode and other factors such as working hours of the bank, etc. So, we rate it 7 out of 10 for the transfer speed. Security : Is Western Union Safe? The Western Union Company, popularly known by its brand name Western Union is the oldest and most trusted money transfer service providers. Therefore, the company uses a high level of encryption to safeguard the information of customers. The company has been affiliated by various authorities across the world in the countries it is serving in. It relies on proprietary and cutting-edge data analysis to always remain compliant with the regulations of all the jurisdictions it operates in. So, one can trust the company with its security policies and measures it takes to save the details of clients. Therefore, we rate Western Union 10 out of 10 for its security. The Western Union NetSpend Prepaid MasterCard allows users staying in the United States to hold the value on a prepaid card and use the card to make and receive Western Union money transfer. One can also use this card to shop online, pay bills, buy grocery, or can collect cash at ATMs. It gives you a quicker and most convenient way to use your money. People can contact the company between 8 am to 8 pm (IST) from Monday to Friday. The company has been providing its apps so that one can transfer funds without any delay. The company provides EUR20 reward if the friend you referred use services of Western Union and transfer funds more than EUR50 in the first transaction. The company time to time provides various offers and discount which will help you in paying less transfer fee or any other offers. These promo codes are shared by notification, SMS or email. Besides all this, the Western Union website is available in various languages, which help it to serve people across the world. It offers personal, business and charitable transfers, but has many areas where it can expand for more growth. On overall user experience, we rate Western Union 8 out of 10. Coverage: How many Countries & Currencies does Western Union support? Western Union is the largest and oldest money remittance service provider, which has grown in over 200 countries and territories across the world. Its services allow people to send and receive money through agents over 550,000 locations. With Western Union send money online, one can send funds to more than 125 countries. It is also providing its services through ATMs and kiosks which are available at various places. The company is focusing on massive digital expansion, which will enable the digital transfer of money across the countries. Currently, the digital options of Western Union are available in the US, Canada, many countries of Europe, Australia and New Zealand. It’s currently expanding this service in Asia, Middle East and Latin America. It has already expanded its services in Mexico, Brazil, Jamaica and Panama in Latin American and the Caribbean; Singapore and Malaysia in Asia; and Bahrain, Kuwait, Qatar and Oman in the Middle East. You can also find the Western Union locations near you here. The company is soon bringing its money sending services in India, where people will be able to transfer INR to other currencies to the friends and family. Still, it has to cover many areas in Asia and the Middle East which will help it to cover the whole world under its services. So, we rate it 8 out of 10 for the coverage head. So, for using the services of Western Union Login. Хорошо, но дорого стоят услуги перевода. Нашол такой же надёжный сервис перевода денег но дешевле, а то и бесплатно! Это Transfrgo, через него можно перевести деньги без комисий и по выгодному курсу! Плюс если при регистрации ввести этот промокод, он же код приглашения, pmgThw то при переводе больше 50 фунтов стерлингов или эквивалент этой сумы в другой валюте, то получаешь 10 фунтов, а это 360 грн на счёт в подарок!!! So for the past few days I have been trying to send an international bank transfer online. Every time I have tried I have had different error messages and it will not let me send the transfer. The latest error is a: Please check your receiver's bank information. C1775 when I know the bank information I have entered is correct. I phoned the customer support which is Indian Call centre with poor quality line and poor English skills and was unhelpful. I think he advised me to go to a shop to send (but still not exactly sure what the hell he was saying), which if he was, is no use for me as shops are shut as its a bank holiday in the UK and I don't want to have to spend hours driving to a shop and want to use technology where I can just enter all the details and sort this now. In the end I have used a different online transfer company with a almost identical exchange rate. The transfer went through first time with no hassle. I will not be using Western Union again. Appalling. Denied service and no reason given. Requested highly confidential information that I refuse to provide. The level of service has declined sharply to an appallingly low level. These people are arrogant and unhelpful. Recommend use of a truly professional company. WU no longer provides service. Me and my uncle got banned. Reason? The same name/surname. We got different second names, still WU does not give a damn. Another transfer got refused and went back to the sender. It is a shame. We live in two different countries. + Support first told my grandmother that someone already picked up the money instead of saying they banned the receiver. Shame. the web site ask for first and last name,so i send 300£ to luis gonzalez but when resiver went to get the money they say i need to put full name, went back to aplication click on edit and put full name luis manuel gonzalez carrillo and resend and they take another 300£ out of my credir card , 10 days and 20 calls plus 10 emails i still got no refund of my money ! Used it on a whim to send £170 to someone else in the UK. Thought that being a big brand would make it safe. Money has never arrived (almost 2 months now). WU claim it's with the correct bank so won't do anything about it. Obviously I had to pay the recipient again in cash and it's now up to them to pursue their bank according to WU. But what motivation do they have? They're not out of pocket. Contact centres are offshore and worse than useless. I wouldn't trust these fools with a penny. Jeg prøver at send penge til Norge...Pengen fra min konto blev annuleret og transaktion blev annuleret men Pengen kommer aldrig tilbage til min konto. har kontakter dem mange gange. de giver mig mange forskellige svar. Så være meget opmærksom om det. sagen er nu hos politet. Every time I tried to pick up the money I had to wait for at least 30-40min because there is alwayssss a problem with the transaction. Last time they told me I have to wait for a day for my identification to be verified so I could pick up the money. This is the service they are offering? But when they need to take the money from you, they are very fast on that. Outrageus. I wish I had read these reviews before trusting these nut jobs! i don't think they even deserve a 1 star! They have held my money for years and have not alerted me of it. I have only just found out when I called up the customer services, apparently, there were two of my transactions that they have held! When I asked them what the MTCN number was and who the recipient was as I could repay them they would not give me the details although I had come through the security. My money, my MTCN number and they won't cooperate! biggest scoundrel industry in the world ! should be taken to the courts for their fraudulent activities and made to pay back all of us of our rightful money! I wish I could leave 0 start. Awful service, They create a such an inconvenience for sender and receiver, no one in sound mind will use them again. Unfortunately, I have sent money through them and now money is held by them (neither they can return you or send to receiver), had sent them various emails, 4 lengthy phone calls each took about a half an hour. Phone operator can't do anything except forwarding your request and you cant talk to compliance team. They can't call you back if call dropped. You cant talk to them before going through various automated options. Avoid at any cost if you like to have no hassle and embarrassment and delay. Okay so I may as well just delete my account WU is obviously not setup for helping customers complete regular international bank transfers to friends overseas. This is my 3rd or so account and everytime I have a problem the only solution was to just delete the account and start again hoping if fixes whatever bug it is that is causing the issue. Customer service is pretty useless WU has obviously become to large of a company to help individual customers. So will just give up and use Transferwise instead as it’s important I am able to send money to my friend on a regular basis right now and WU keep blocking my ability to do this for some reason. Worse place to send money but best place for scammers. Western Union is for scammers please stay away because they have no return policy if you fall victim and they will even lie to you that they are investigating but what they mean is they are writing to inform you are not eligible for a refund. A company for the cave people to transfer money!! I have been transferring money with WU for as long as I can remember but I was using the traditional way. Going to a WU point/shop/store/point and fill up a form and 15 mins later I am done. But recently I have started using there so-called online transfer service. Then I figured out why there are people so mad at WU. Trust me on this when I say, I am not a person who gets angry easily or judge someone without evaluating. I have been trying to make a transfer with WU inside EU and the web site loading took forever (I let it slide). Now comes the part where I lost it, I am at the review page, already got my transaction notification in my phone from the bank and the app just stopped working. So I checked the notification and found that that was 0.00 euro card validation check. So far so good, money is still safe. I click the final "send" button and the app went into loading mode and shows that my banks 3D secure is not working in a frame and that's it. So, to verify that, I instantly try to use my card in another site to buy something and it went smoothly with the same 3D secure that WU claimed not working. So I thought, let's give another try. I did try again. Same issue. Then I thought why not try the app from my phone. In the app, they went a step further with this. In the website on a laptop, they were at least showing some BS message - the phone app just gone straight to the white screen. I waited for something to happen for at least 5 mins. When a money transaction is not timed out in 1 min there is no point in waiting, everyone knows that. But just because I needed to transfer money urgently I showed some patience. Then I just gave up. So to WU, Please be honest with your customers and let them know that your online web app and mobile app is absolute garbage. No one should use them. I know also that WU will come up with the response (if they respond) like - please give us more details on the problem you are facing. It doesn't take a genius to know when your product is broken or not performing well. WU, If you keep doing these in this era when technology is dominating then be sure that you are going to lose popularity faster then you have ever imagined. 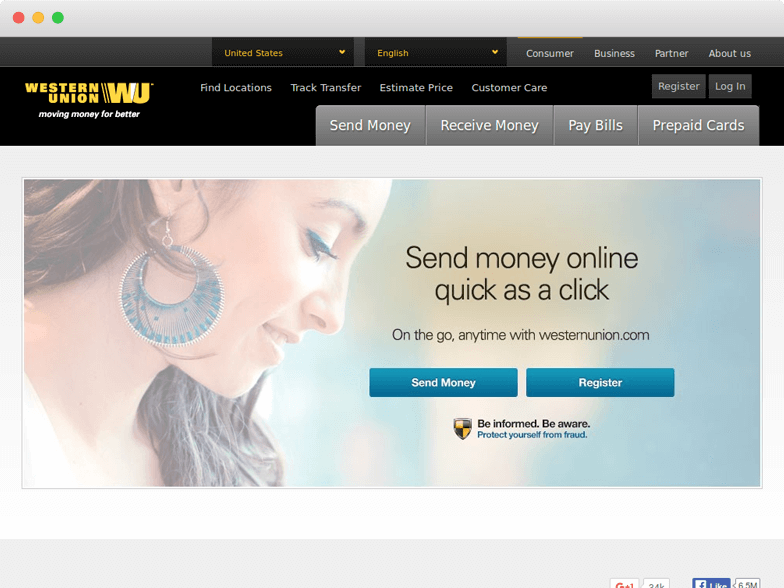 Go to the website of Western Union and click on “Send Money” at the top of the home page. You will be redirected to the new page. Here select the country where you want to send the funds. Enter the amount and select how the recipient will receive the money. Sign up or login if you are an old user. Enter all the personal details of you and the recipient. After logging in confirm the transaction. The company will provide you with “Money Transfer Control Number” on email which will help you in tracking the transaction.